10 Wavy Lob Hair Styles - Color & Styling Trends Right Now! Wavy lob hairstyle are not only easy to style, but also highly fashionable right now! It’s a style that suits all hair types and a good stylist will advise you on the best version for your face-shape and skin tone. 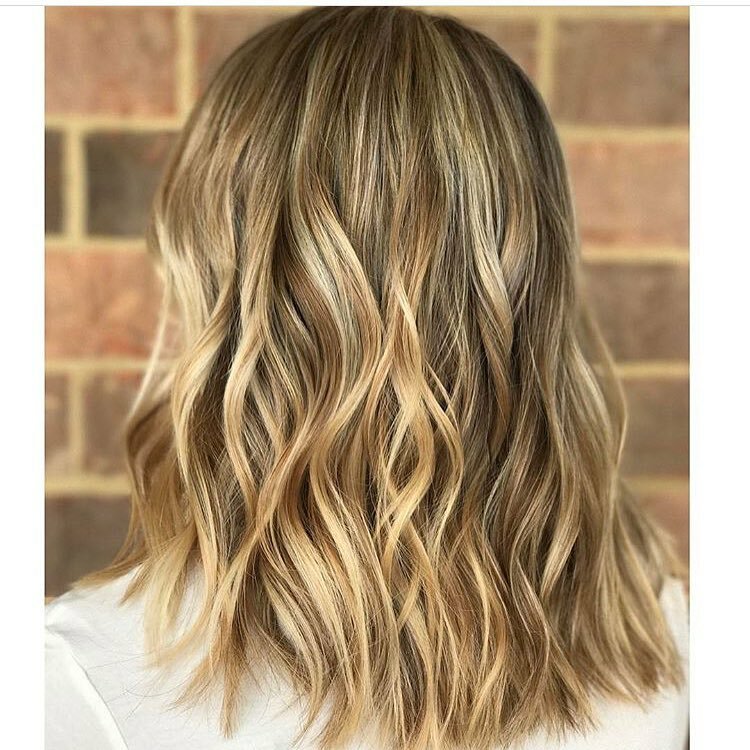 Today’s gallery of wavy lob hairstyles includes lots of different lengths, wave patterns and shapes for thick, medium and fine hair. But not only that! These lobs show the full range of fresh hair color ideas. And don’t miss the new trend towards the ‘flicked-out’ look! 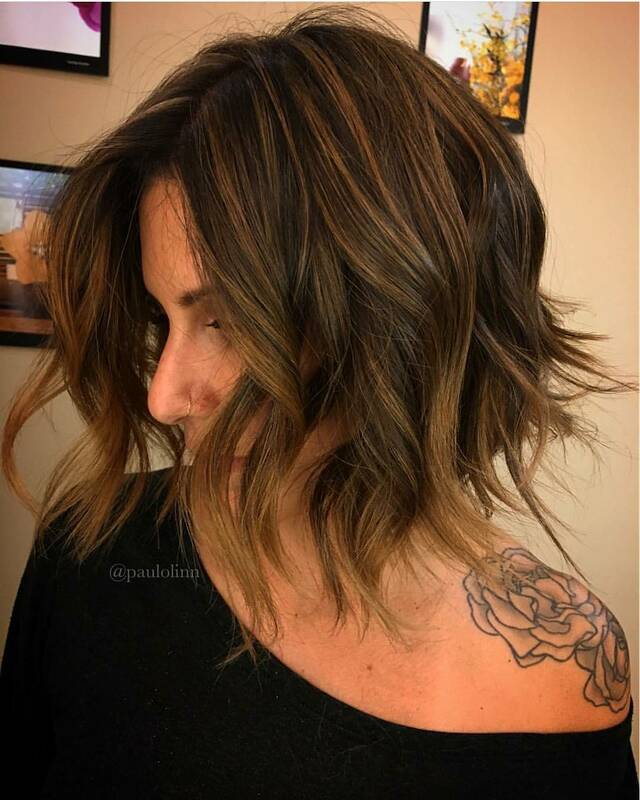 Simple styles look great with lots of balayage and contrasting color to spice it up! 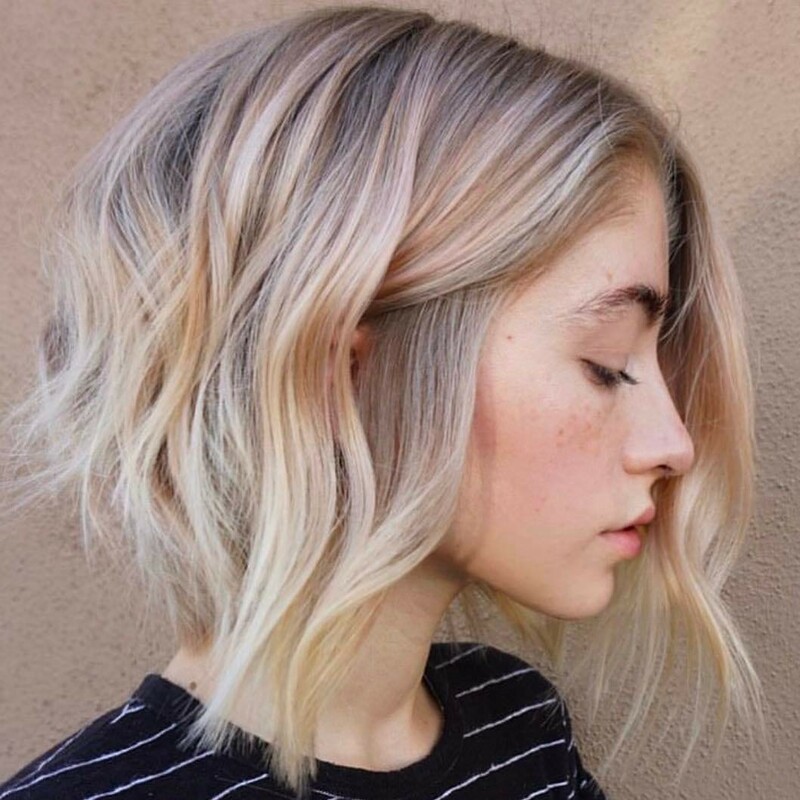 This lovely long bob lets brunettes ‘go blonde’ in a classy way with two different shades of ash-blonde. This creates extra color-depth and sheen on fine hair. Notice how some of the tips are tinted dark ash-brown to create a ragged-edge look at the ends. This is good for hair that isn’t thick enough to have lots of layers and textured tips! This trendy wave pattern is a strong ‘bend’ half-way down the head, creating interesting shapes and volume. The tips have been heavily textured to produce fashionable straight tips and a wispy outline, so you need thick hair to achieve the same look. There’s a face-flattering wave on either side at the front. So although this is also a long, wavy lob hair style, you can see how much the cut differs from the image above. Lovely caramel and beige-blonde around the top gives a softer look, but the edgy tips are given a sun-bleached blonde look! This blonde, wavy lob features thick vertical highlights in two, pale shades of golden-bonde and copper-blonde. 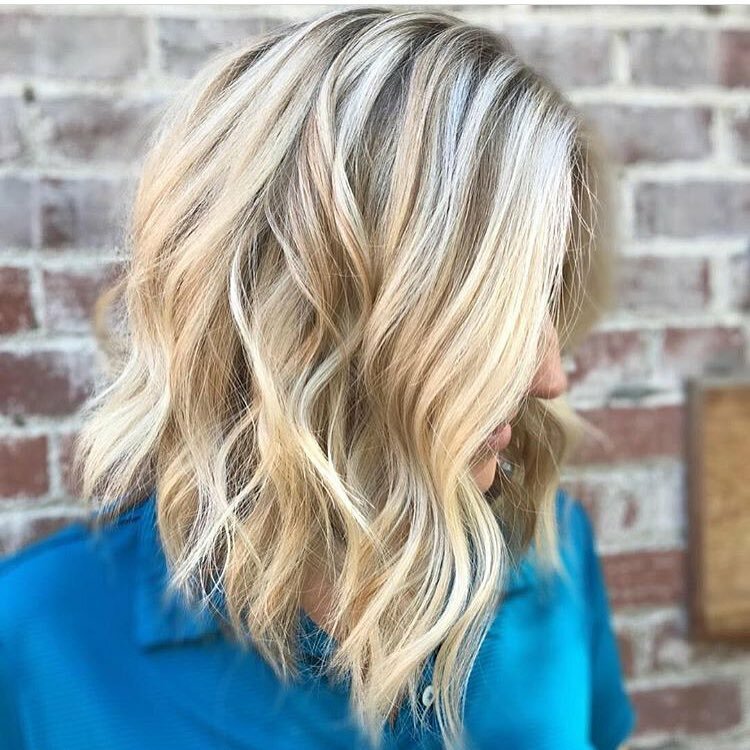 These warm shades of blonde are an excellent way to bring color depth and warmth to dark-blonde/mousey hair that lacks personality! The hair has long layers so you can get more volume and interest at the sides with a random ringlet. And the slight wave half-way down the head emphasizes the fashionable slanted line and fabulous forward movement! If your hair is straight and a natural shade of copper, then you very likely also have fine hair. 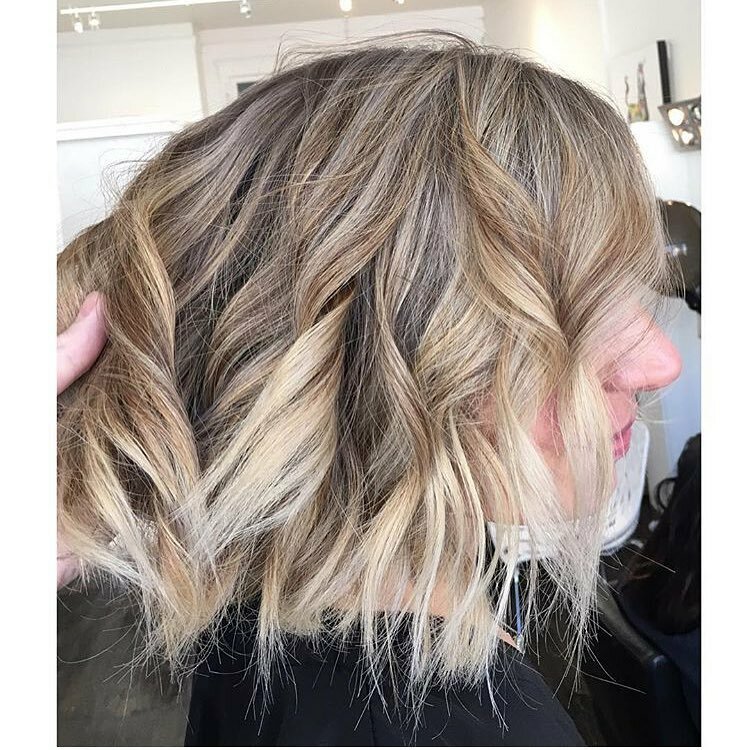 This long bob looks thicker owing to the clever use of blonde balayage which makes the highlighted waves jump out from the darker tresses in a 3-D effect. Tousled waves are also a girl’s best friend adding fluffed-up volume you could never achieve on a straight style! We love the subtle and natural color blending on this gorgeously ginger lob. This lob has super-spikey tips for an edgy finish beneath barrel ringlets that are being well-tousled for a lightly wind-swept finish. The base shade of light-brown has been well and truly balayaged in dual blonde shades and dual brown lowlights. The colorist has also added a nice hint of gold in the highlights to suit the model’s warm skin undertones. And this style will have plenty of volume at the sides, under a flat, top section, making it a great style for adding width to a thin or long face shape! Fine hair doesn’t always look its best in very long hairstyles, but the long bob with a chunky shape makes a great mid-length compromise. This style isn’t layered, so it keeps its natural thickness and relies on the blunt-cut bottom line to create a denser appearance. 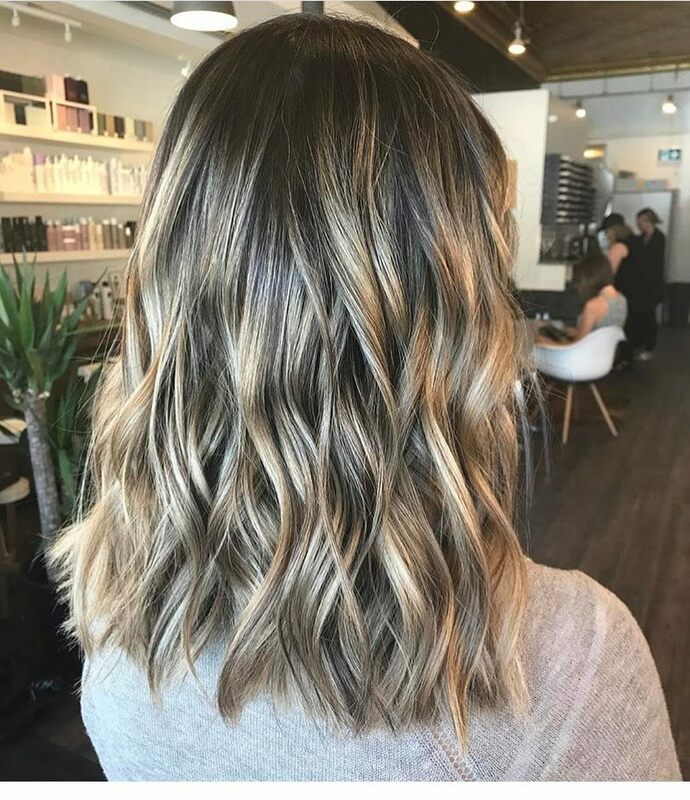 The wave pattern is fairly flat, but the light-blonde tips over pale copper hair underneath, create defined-wave volume and a lovely 3-D effect! Here’s a very fashionable, shorter lob style with a strongly angled line and well-shaped back section. 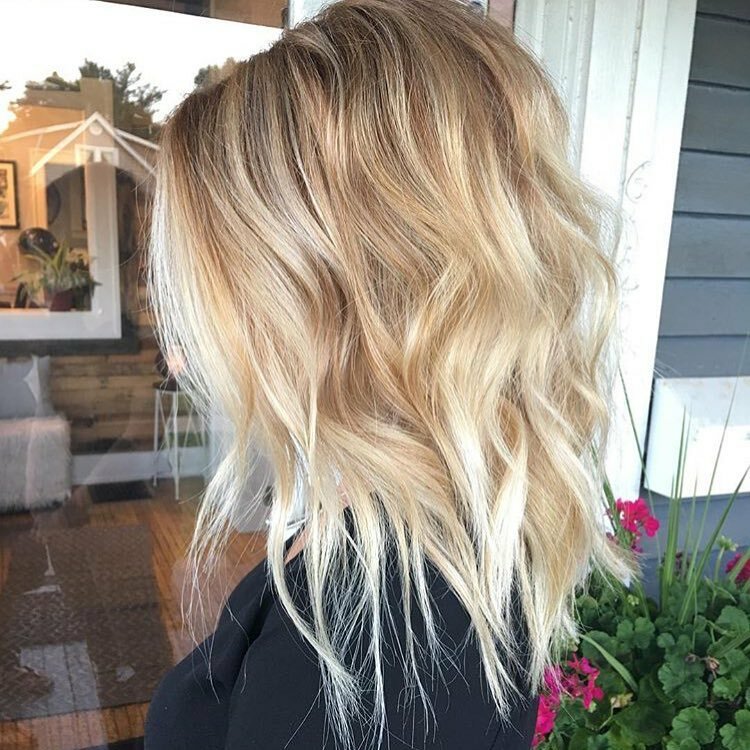 The roots are left in the natural dark-blonde shade for an extra layer of color, making the fab shade of neutral blonde stand out! There’s also a groovy hint of pink in the hair, adding just the right touch of warmth to suit the model’s pale skin with a warm undertone. You can see how it matches her pink cheeks and lips perfectly! 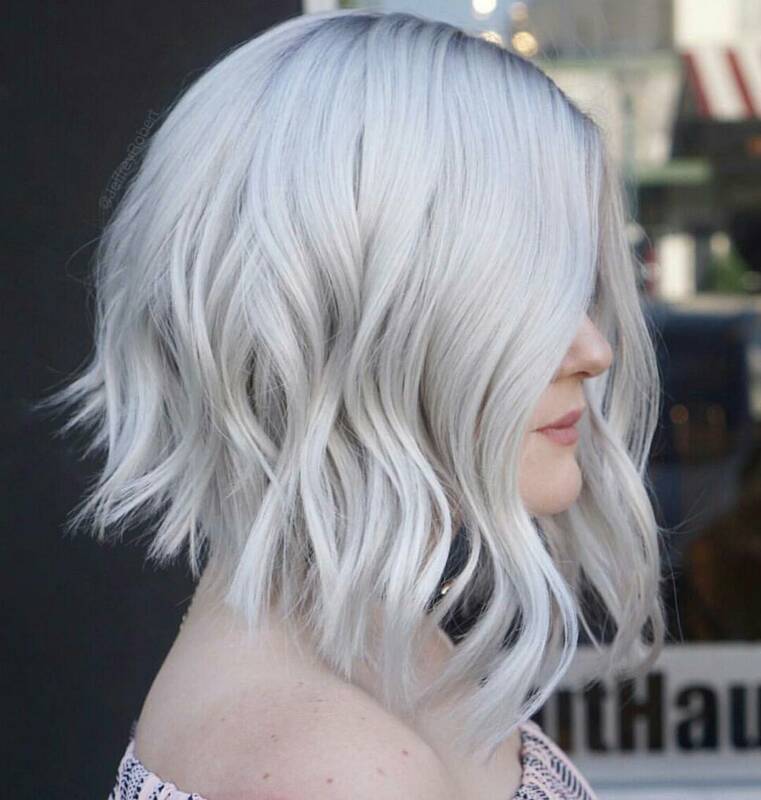 This icicle-cold, platinum-blonde lob is a real statement hairstyle, so get ready to be the center of attention! It has a lavender-blue toner giving the white-blonde an ultra-cold sheen that suits skin with a cold undertone. Viewed on a trendy angled bob, the effect is futuristic and striking. However, you do need naturally blonde hair to achieve this degree of lightening, without damaging your hair. Just as the first bob hairstyles concentrated on making hair sleek and curved under, modern lobs are increasingly showing flipped-out tips! This stylist has taken the angled bob and re-styled it for a casual, but very fashionable new shape. The hair is cut in long layers, with heavily textured tips flipped out for an edgy, spiky vibe. 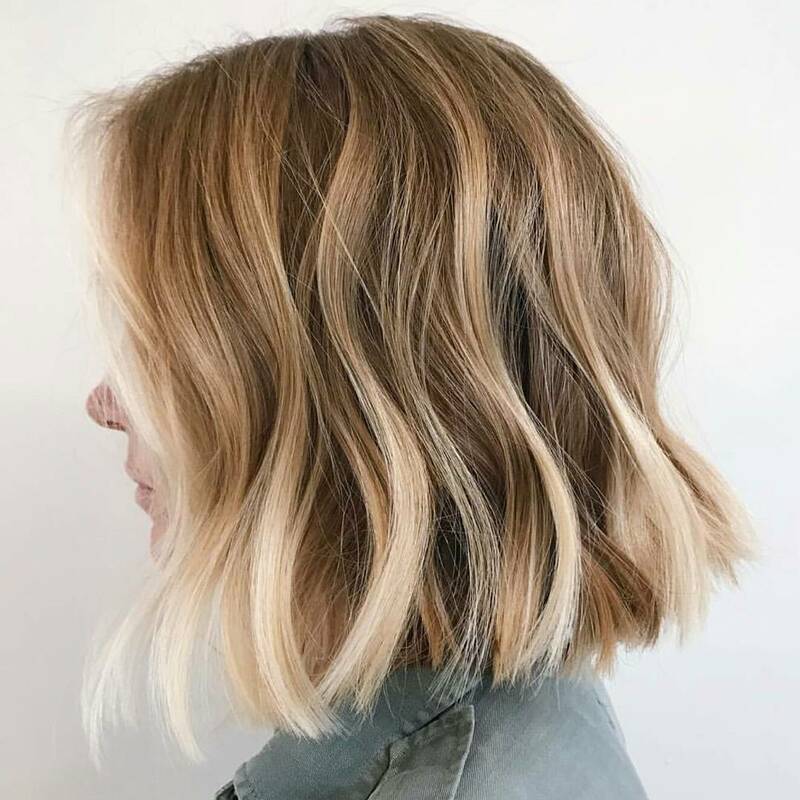 There are subtle mid-blonde highlights, too, which accentuate the trendy texture and lively movement in this great rebel lob! This rich shade of russet-red is extremely popular again this year! So if colorless ash-shades aren’t your thing, don’t worry! 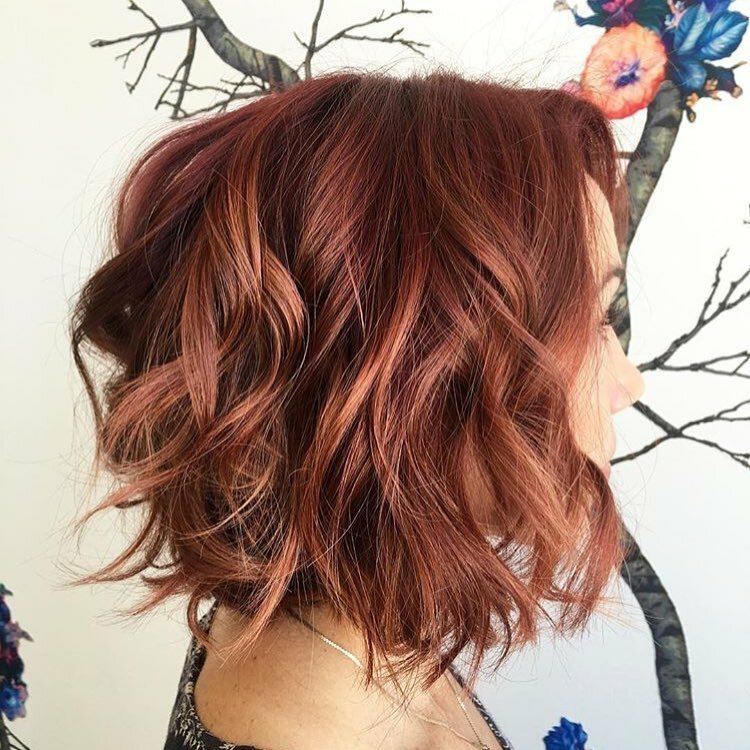 The red-head colors are never completely out of fashion and this mid-length bob has several new twists to keep you right up-to-date. The spikey tips and windswept waves produce a totally modern vibe and there are some very subtle balayage highlights, too. The pale, orangey-red highlights accentuate the tousled waves in a style with lots of lively movement!